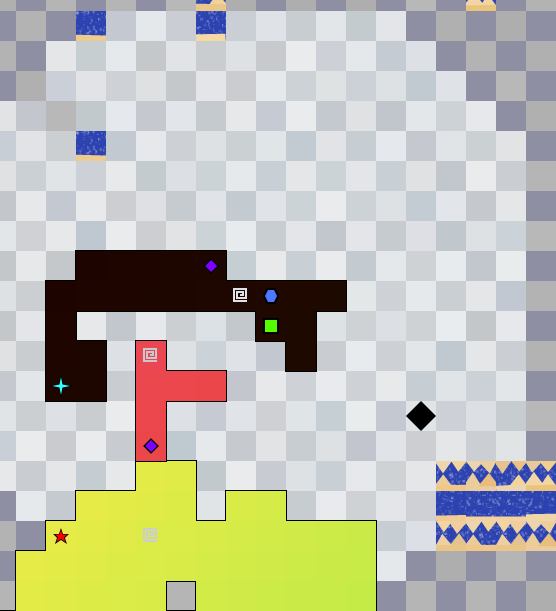 An abstract dungeon crawler with multi-tile enemies. The player can absorb enemies to become larger. Multi-tile enemies, a rare feature in roguelikes. Though a few RLs do have large enemies, most are stationary or limited to a snake shape. To my knowledge, none have multi-tile player characters. Incredibly simple controls and UI. No in-game HUD, menus, or text. No controls beyond 4 direction movement. Despite the total lack of HUD/menus, DUMUZID includes a prayer mechanic, a limitless inventory, and a magic system with discoverable spells. "Inanna passes through a total of seven gates, at each one removing a piece of clothing or jewelry she had been wearing at the start of her journey, thus stripping her of her power." After leaving the underworld, Inanna is angered to find that Dumuzid is not mourning her. She casts demons on Dumuzid and he is sent into the underworld himself. DUMUZID is a continuation of that story. The player's journey is a reversal of Inanna's. You must also travel through seven gates to escape the underworld in DUMUZID. But instead of losing pieces of yourself to become less powerful, you are often required to attach new pieces to yourself to become more powerful. This page was last modified on 10 November 2015, at 21:04.